There are many important cars a restorer restores and particular ones he will remember vividly. Some will be remembered for rough spots during the process, some for the friendships and stories acquired over the months of problem solving…and some simply because they are the last one that is completed, fresh in the mind. Predictably, as time goes by, many cars are forgotten in the minutia or pushed to the back of the memory bank. After almost 40 years of bringing old cars back to life I can report, whether due to quantity or age, that few cars remain vivid in the midst of a hundred others. One car and the restoration associated that I will never forget is the 1949 Porsche 356/2 Gmünd Coupe Chassis No. 356/2-017, or as the car became affectionately known, “17th”. In the spirit of brevity and in with respect to how many canned auction catalog descriptions most of those reading this have probably already read and will read over the next year (not that a Gmünd Coupe will be on offer, sorry Porsche nuts), I’ll spare the reader the ins and outs of what the Gmünd cars are and what they mean to the Porsche brand historically. There is plenty of info out there that one can easily get from a quick google search on the model so have at it. In 1980, Bob Raucher, one the founding members of the Porsche Club of America, active for 50 years in the club and an early board member of the Porsche 356 Registry bought the “17th” Porsche Gmünd Coupe. Bob came to me with the idea of restoring the car and thus I was sent go see the car. At the time, the car was not at Raucher’s place, but rather, it was located at Gene Winfield’s shop in Chatsworth, California. The original photos you see in this article (the two directly below) are from when I went to visit Gene and see the car for the first time to get an idea of what sort of restoration we were headed towards. As many of you will know, Gene Winfield was, even at this early time, a huge figure in the Southern California custom car scene well known for his 50’s and 60’s customs and custom paint jobs. At several points Gene Winfield even managed to cross over into main stream pop culture. As an interesting side note, this little affair with the 17th Gmünd Coupe was still several years prior to Gene Winfield’s first major advance on the Hollywood big screen when he came to be quite famous, working with futurist Syd Mead (also a car guy, whom I bought a factory rudge/NSL engine Gullwing from in the 2000’s), for his work on the iconic film Blade Runner which starred a then quite young and rather new to film Harrison Ford. At the time I was presented with this restoration job I was generally hungry for work and in particular was on the look out for interesting projects. Regardless of hindsight, the importance of working on one of the first Porsches ever and being involved in what was perhaps the first attempt at bringing a Gmünd car to a show quality restored condition was intriguing to me. Needless to say, I didn’t need a whole lot of convincing to take the job on. 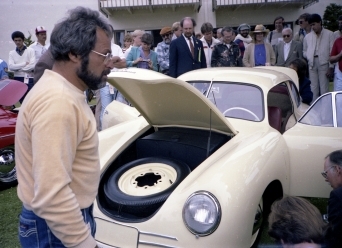 The “King of Kustoms” Gene Winfield at his shop in Chatsworth, California looking on at the 17th Porsche Gmund. This was my first time seeing the car that Bob Raucher had asked I restore for him to show at Pebble Beach. After getting a good look at the car at Winfield’s place, it was rather clear that the car was in a pretty dilapidated state but had been kept in the good graces of the California dry weather for quite some time, thus it was hardly a “lost cause” level total remake candidate. To the contrary in fact, it was a great starting point for what we were tasked with doing. The car was for the most part complete and as far as I could tell, outside some minor corrosion on the lower panels, the aluminum body was completely original having had only on a minor brush with damage in the form of an accident which affected the lower part of the front end. Whatever happened did not go so deep as the chassis, but we were going to have to reconstruct the bottom half of the nose regardless. Noticeably absent from the car was the front bumper, probably discarded whenever whatever happened happened. Of particular note about this car is that it is to my knowledge the earliest Porsche to retain its original engine! The original motor had been taken out early on in its life and a Volkswagen engine had been installed for use. The original motor was kept with the car up until Raucher bought it and we were tasked with re-installing it and getting it back into running condition. We were not tasked with rebuilding the motor in house, but we did do all the engine and engine bay cosmetics once it was back in properly sorted working order. The body and engine were reunited in my shop during the restoration process and looking back I feel happy to have been a part of that reunion. Photo of the car at Winfield’s shop in Chatworth, Ca. The complete but in need of rescuing the 17th Gmünd Coupe prior to restoration. As mentioned above, the front bumper was simply gone. It probably had been damaged and discarded at the time of the minor accident that had occurred affecting the front end so I was left with quite the challenge in front of me. There was really nothing that could replace the bumper outright as no junkyard was likely to have a Gmünd car sitting in it awaiting my interest. Also, the bumper for the car is very unique so modifying the bumper of another model, Porsche or otherwise, wouldn’t work either. In the end, I made the bumper from scratch based on period photos, using my experience in metal shaping to craft what was quite a unique front end accent. I have restored many cars over the years where I was confronted with unique challenges, but it is not often that I have personally tasked myself directly in crafting something so fundamental to the car itself (my self ascribed greatest talent in restoration has always been the ability to spot and hire exceptionally talented people). But such was the case with my personal imprint on the front bumper of this “17th” Gmünd Porsche, a car incidentally that Ferry Porsche and his crew hand crafted similarly out of aluminum sheets pounded to form over wooden bucks. I imagine my process for creating the bumper was quite the same as theirs, though from the looks of the shop conditions they worked under in the period photos I have seen, I probably had a few more creature comforts to retreat to in between metal working sessions. In addition to the missing front bumper, another, more general, major challenge in the restoration of this early Porsche was confronting a car that was complete but did not have many intact original surfaces. It had quite the wavy body due to whoever had ground the paint off of it unceremoniously (and incorrectly) and the oversized gaps in the panels were in no way suitable for the show-field example we were aiming to achieve and present at an event like Pebble Beach. We hid many of the build quality flaws quite well, adding metal where necessary for better gaps, smoothing out the body lines and doing the time consuming preparation to finish the paint job that was very pleasing to the eye in the final product. Of particular note about this car is that it is, to my knowledge, the earliest Porsche to retain its original engine. The original motor had been taken out early on in its life and a Volkswagen engine had been installed for use. The original motor was kept with the car and we were tasked with re-installing it and getting it back into a good looking and running condition. We took the 17th Gmünd to Pebble Beach in 1982 and competed in the Porsche class with other well restored cars. With a final cost of under $20,000 (several percentage points lower than a current restoration budget on a Pebble Beach show car) for the cosmetic restoration plus an additional amount for the engine rebuild we had a finished product that was very nice and one that we were proud to show. We finished the car in a true to original lovely cream colored exterior over dark red interior which made for a correctly conservative, elegant presentation. The car now had “concours” quality even gaps and the paint, interior and body work were very nice, probably some degree nicer than the car would have ever originally enjoyed. 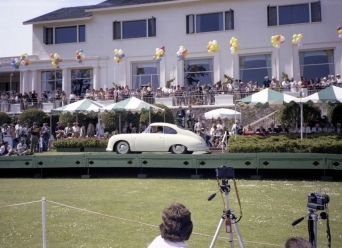 Bottom Left: Owner of the 1949 Porsche 356/2 Gmünd Coupe Chassis No. 356/2-017, Bob Raucher. Surveying the judges at Pebble Beach and waiting to see if a trip to the podium was in the cards. Bob passed away in 2015, this great early Porsche owes him a debt of gratitude. Bob was a well known historian, literature collector and concourse judge in the Porsche community. All said and done the car won a spot at the podium in a class of Porsches (Porsche judging, even in the early 80’s, was very strict and particular), and another older Porsche, the very first Porsche in fact, was there at the show that year but I cannot remember whether it was there to be judged or not (I suspect not as most cars brought by the factory that made them are not). Whether 356/1 Roadster was judged that day or not, I took pictures of it as you’ll see below and despite several research trips back to Germany after that day at Pebble Beach I have not seen the Porsche 356/1 since. Porsche No. 1 Type 356, now housed at the Porsche Museum and brought to Pebble Beach by Porsche AG the same year as we brought our restored Gmünd Coupe. To the best of my knowledge, there are seven Gmünd Coupes accounted for in private collections and at the Porsche Museum. “17th” currently resides in the Ingram Collection of North Carolina, where I am told it is their earliest Porsche example. It is thought that there may be another 10 or so cars in varying states of (dis)repair and restoration in Europe and the rest of the world but this is all second hand and I’m sure someone out there can clarify this a bit better than I. By my math that means this car is one of possibly 17 genuine examples remaining (yes, convenient math for an unsure proposition), which would be quite the coincidence but perhaps not quite the truth. Chassis No. 356/2-017 is an incredibly important and rare car regardless of how many others like it remain…the car is perhaps only slightly rarer than a 71 year old remembering every last nut, bolt and charmingly flawed original gap from a restoration he embarked on almost 40 years ago. A special thank you to Michael Furman for allowing me to use some of his incredible photos of this Porsche. Find more of Michael’s work HERE.